Description: Eastbound stack headed up Echo Canyon on the Overland Route after a late winter storm. Description: UP 3944 heads West with a K-Line Stack train round the curve at Kennard Nebraska. Description: Westbound through Chambersburg on the NS Lurgan Branch with all foreign power. The second unit is FerroMex. Description: Westbound stacks heading for Hearne, TX. Description: Westbound stacks bang the diamond. Description: This train with Unpatched SP 8586 SD40M-2 pulled up and stopped short of the KCUS Pedestrian Bridge while they waited for the grain train to cross over from Main Track 2 to Main Track 3. Description: Sure was nice of the crew to stop in a place where we could record it. There are around 60 SP's left at this time. The unit still retains its Old Maintenance Base Lettering: El Paso. Description: The other units are 9638, 5070, and 7608. Description: NS Northbound Vehicle Train 22R passing through 32nd Street Interlocking in Birmingham, Al. Description: Stack train passing a coal MT, just around the corner is the Kate Shelly bridge. its double track but only one train can cross it at a time. the future approach to the new bridge is visible on the left. Description: Eastbound stack train rolls along the Green River on the Evanston Sub. 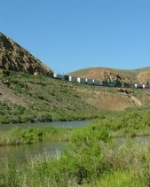 Description: Eastbound stack train crosses the Green River in Green River Wyoming. Description: Stack train heads East on the Evanston Sub. Description: MRVSJ-08 Power, tied down at Santa Clara.